HAMPSHIRE NEWS - The body of A. Martin, who died at St Mary's, W. Va., was brought here Monday night and was buried at Ebenezer Tuesday morning. Mr. Martin was a son-in-law of Chas Corbin, of this place. Andrew Martin, 69, of 638 Columbia avenue, a B and O crossing watchman, died yesterday afternoon at Memorial Hospital, where he had been a patient since May 8. He was employed as watchman on the Franklin street crossing for 20 years and was well known in the North End. He was a son of the late Philip C. and Mary Arnold Martin, and was a member of St. Patrick's Catholic Church. Surviving are his widow, Mrs. Eunice Humbertson Martin; three sons, Ambrose C. and Philip C. Martin, Cumberland; and George Martin, Cash Valley; a daughter, Mrs. James Darrow, Frostburg; three brothers, Dominick and Frank Martin, Cumberland; James Martin, Cash Valley; two sisters, Mrs. Agatha Spoerl, LaVale, and Mrs. Anna Michaels, Eckhart. WESTERNPORT - Arthur (Punk) Martin, 79, of RD 1, Cosgrove Lane, died yesterday at his home. Born in Westernport, he was a son of the late Robert and Emma Marie (Wright) Martin. He was a retired coal miner and worked for a number of years in Philos Cemetery. Twice married, he was preceded by his first wife Mary (Duckworth) Martin in 1919. Surviving are his widow, Grace (Ahern) Martin; two sons, William Martin and Robert Martin, both of Westernport; two sisters, Mrs. Mary Freal, Catonsville, and Mrs. Anna Rounds. Whittier, Calif.; ten grandchildren and one great-grandchild. Friends will be received at the Boal Funeral Home today from 7 to 9 p.m. and tomorrow from 2 to 4 and 7 to 9 p.m. Services will be conducted there Sunday at 1 p.m. by Rev. Sumner Sawyers. Interment will be in Philos Cemetery. Bernard Martin, 47, Clarysville, died suddenly from a heart attack this morning in Morgantown, W.Va., where, he had been working for the past year. He formerly worked for Kelly-Springfield Tire Company. He is survived by his wife, Hilda Delaney Martin and seven children: John, Thomas, James, Rita, Margaret and Agnes, all at home; one nephew, William Donahue; two sisters, Mrs Agnes Vocke, Detroit, Mich; Mrs Aloysius Winner and one brother, Thomas Martin, Detroit, Mich. He was a member of St Michael's Catholic Church, Frostburg and the parish Holy Name Society. Mrs. Bertha M. Martin, 53, of Railroad Street, Mt. Savage, died early today in Allegany Hospital where she had been a patient for three weeks. A native of Mt. Savage, she was the daughter of the late William H. and Carrie (Kerns) Carter. She was a member of Mt. Savage Methodist Church and had been employed at the Kelly-Springfield Tire Company for 21 years. She is survived by a son, Charles Oscar Martin; a brother, Robert A. Kerr(sic) Cumberland, and a sister, Mrs Barbara Lease, Keyser, W. Va. The body will remain at the Hafer Funeral Home, Cumberland, from where services will be conducted Saturday at 3:30 p. m. Officiating will be the Rev. M. A. Keesecker, pastor of Kingsley Methodist Church, Cumberland. Interment will be in the Mt. Savage Methodist Cemetery. Rites for Mrs. Bertha Martin, 53, Mt. Savage, who died at the Allegany Hospital Thursday, were held at the Hafer Funeral Home yesterday, with Rev. J. L. Moore, pastor of the Methodist Church, Ellerslie, officiating. Mrs. Martin was employed by the Kelly-Springfield Tire Company for 38 years. The pallbearers all from Department 41, of Kelly were: Charles Emmeit, Boyd Garland, Frank Harbaugh, LeRoy Crowe, James Ritchie and Gerald Hager. Interment was in Mt Savage Methodist Cemetery. Eckhart - Mrs. Betty A. Martin, 62, died Sunday at the Sacred Heart Hospital hospice unit in Cumberland. Born in Eckhart, she was a daughter of the late Horace Anderson and Margaret (Porter) Anderson. Mrs. Martin was formerly employed by the T & S Drug Store in Frostburg. She was a member of the Eckhart United Methodist Church. Surviving are her husband, William F. Martin Sr.; one daughter, Mrs. Debbie Lashbaugh, Clarysville; one son, William Martin Jr., Brunswick; two sisters, Mrs. Shirlely Fairburn, Washington, D.C.; Mrs. Norma McKenzie, Idyllwild, Calif.; one brother, William R. Anderson, of Florida, and four grandchildren. Friends will be received at the Durst Funeral Home, Frostburg, Tuesday from 2 to 4 and 7 to 9 p.m. Services will be conducted at the funeral home Wednesday at 1 p.m. by the Rev. George M. Harpold. Interment will be in Rest Lawn Memorial Gardens, LaVale. Pallbearers will be Mark Martin, Denny Martin, Carl Pate, Edward Gaughan, Richard Fuller and Frank Sivic. The family requests that memorial take the form of donations to the Sacred Heart hospice unit. Miss Bridget Martin died at her home in Pekin from heart trouble. The deceased is survived by her mother, Mrs. E. Martin, two brothers, Dan Martin, of Pekin, .and John Martin, of Lonaconing, and the following sisters, Mesdames John O'Connell, of Pittsburg: Mrs. McLaughlin, of South Dakota; Miss Ella C. Martin, of Pekin, and Mrs. John Hannon, of this city. The funeral took place this morning at ten o'clock from St. Gabriels Catholic church of Barton. Interment was made in the Catholic cemetery at that place. A large crowd from here attended the funeral. Carl Willard Martin, 64, of RD 3, Valley Road, died today at his home following a year's illness. A native of Cumberland, he was the son of Mrs. Lillian (Rizer) Martin and the late William A. Martin. Mr. Martin was a self-employed plumber and a member of the Veterans of Foreign Wars. His wife, Emma E. Martin, died in 1961. Besides his mother, he is survived by three sons, Carl W. Martin and Robert F. Martin, both of here; Max W. Martin, Patuxent River, Md. ; one daughter, Mrs. Ronald Waltz, Joppa; four brothers, Luther Martin, Ralph Martin, Paul Martin, and Charles Martin, all of here; five sisters, Mrs. Harold Bloom, Cocoa, Fla.; Mrs. Margaret Elrick and Mrs. Harry Price, both of here; Mrs. Charles Easton, Hyattsville; Mrs. Thomas Brode, Ellerslie; and 19 grandchildren. The body is at the John J. Hafer Baltimore Avenue Funeral Home where friends will be received tomorrow and Sunday. Services will be conducted Monday at 1:30 p.m. in the funeral home by Rev. John S. Park, pastor of Kingsley Methodist Church. Interment will be in Hillcrest Burial Park. Mrs. Christopher Martin - Mrs. Catherine Martin, 87, of the Miller Rest Home, 150 W.Woodland Ave, died of infirmities at 3:10 p.m. Tuesday at the home. Mrs.Martin was born Oct 20, 1867 in Maryland, the daughter of Mr. and Mrs. George Rizer. She came to Youngstown about 40 years ago and before going to the rest home, she lived about 3 years with a daughter, Mrs. Pearl Jackson in Sand Patch, PA. She was a member of Hillman St. Christian Church. Her husband, Christopher Martin, died in 1932. Besides Mrs Jackson, she leaves 2 other daughters, Mrs. Geneva Summers and Mrs. Alpha Webb, both of Youngstown; 5 sons, George of Meyersdale, PA; Howard of Belton, TX; and Roy, Charles & Louis of Youngstown; 27 grandchildren and 42 great-grandchildren. Funeral services will be at 1:30 p.m. Friday at the Shriver-Allison South Side Funeral Home, where friends may call tomorrow evening. Charles Ray Martin, 63, of RD 1, Valley Road, died yesterday at Sacred Heart Hospital. He had been residing in Cumberland the past year, moving here from Morgantown, W. Va. Born in Little Orleans, he was a son of the late Edward R. and Christina (Smith) Martin. His wife, Naomi R. (Iser) Martin, preceded him in death. Mr. Martin was a retired coal miner and a member of the United Mine Workers of America. Surviving are his stepmother, Mrs. Lillian E. Martin, Little Orleans; four sons, Thomas E. Martin, Richmond, Va.; Charles H. Martin, Alvin L. Martin and Lawrence O. Martin, all of Morgantown; seven daughters, Mrs. Lora D. Brady, Baltimore; Mrs. Louise Wiles and Mrs. Judy E. Deeley, both of Morgantown; Mrs. Mary J. Wolfe and Miss Patricia E. Martin, both of Richmond; Mrs. Christina R. Buxton, Memphis, Tenn.; Mrs. Edith M. Dennison, Aliquippa, Pa.; one half brother, McKinley B. Martin, Big Pool; one half-sister, Mrs. John Divico Valley Road; 19 grandchildren and three great-grandchildren. The body has been taken to the Fred L. Jenkins Funeral Home, South High Street, Morgantown, for services. Source: The Cumberland News; Cumberland, Maryland; Feb. 14, 1974; page 21. Mrs. Clara Martin, widow of William Martin, died yesterday at a Somerset Co., Pa., hospital. She was 81. Surviving are two brothers, Albert Christner, Berlin, and Lewis Christner, Garrett, and a sister, Mrs. Harry Nickel, Louisiana ave., Cumberland. The funeral will be held Wednesday at Berlin, with burial at Garrett. The body of Edgar C. Martin arrived in Meyersdale, May 25, from overseas on the ship, Laurence Victory. It was taken to the home of his parents, Mr. and Mrs. George Martin, R.D. 3, where funeral services were held Friday afternoon at 2:30 o'clock. The Rev. S. Loren Bowman, pastor of the Church of the Brethren, of which young Martin was a member, officiated. Interment in Union Cemetery was made under the direction of H. R. Konhaus. Edgar was born October 22, 1925. He was inducted into the Army January 19, 1944, and sent overseas in June 1944. October 10, he was wounded and hospitalized one month, returning to duty November 10. Two days later, he was seriously wounded and, December 18, 1944, died. He was buried in the Vasges area in France. Edgar is survived by his parents and three brothers, George, Jr., and Glenn, both of Meyersdale, and Earl, at home. "Frostburg, Nov 20--Miss Ella C. Martin, 76, retired school teacher, Pekin, died this morning at the home of her nieces, the Misses Agnes and Loretto Hannon, 154 Centre Street, after an illness of three months of heart trouble. A daughter of the late Patrick and Ellen Burke Martin, of Corriganville, Barton and Pekin, she was born at Hays Station, near Pittsburgh, Pa., where her parents moved on account of Civil War conditions. She has been a resident of this county for nearly 70 years. Her father came to this country in the early nineteenth century from Ireland. Her maternal grandfather, Daniel Ulic Burke, also from Ireland, was an engineer who helped build the Chesapeake and Ohio canal. She was a graduate of Baltimore State Normal School and attended the University of Nashville, Tennessee for two years. The last surviving member of her family, she had made her home with her brother, the late Daniel Martin, who conducted a general store in Pekin for more than half a century. Other deceased brothers and sisters were John A. Martin, Lonaconing business man; Patrick of Denver and Omaha; Mrs. John J. Hannon, Frostburg; Mrs. Thomas P. O'Connell, Jeannette, Pa.; Mrs. Edward C. Laughlin, Minneapolis, Minn., and Miss Bridget Martin, Pekin. Besides the nieces with whom she was residing, she leaves the following other nieces and nephews: William Hannon, U.S. appraiser, Chicago; Thomas Hannon, employed at the Cumberland post office; Joseph J. Hannon, Mrs. James Wheatley, and Mrs. Michael Carney, Washington; Mrs. Joseph Footen and Mrs. E. V. Coyle, this city; Thomas J. Martin, Piedmont, W. Va.; Robert Jenkins, Baltimore; John E. Martin, Mrs. Harry Stumpf and the Misses Loretta, Catherine, Mary and Agnes Martin, Washington; Thomas Francis O'Connell, Mayor John Martin, Daniel O'Connell and William O'Connell, Jeannette, Pa.; Mrs. J. Charles Murphy, Wilkinsburg, Pa., and Mrs. Edith Laughlin, Carroll, Minneapolis. Miss Martin's death marks the third in the Hannon family in four months. Mrs. Evelyn (Honaghan) wife of William Hannon, died in Chicago in July and Mrs. Eleanor (Hannon) wife of Anthony R. Gerdeman, died in Cumberland in August." Died at Pekin Mrs Ellen Martin, died at her home in Pekin yesterday at 4:45 a.m. Funeral Wednesday from St Gabriel's, Barton. Burial in Barton Catholic cemetery. The funeral of Mrs Ellen Martin, who died Monday took place from her late residence in Pekin yesterday morning at ten o'clock. A high mass of requiem was celebrated by Rev Fr Scarpetti, while Rev Fr Nolan, a relative of the deceased, assisted by the Lonaconing choir rendered some excellent music. The pallbearers were Mr Martin Nolan and the grandchildren of the deceased, Messrs Al Thomas and Joseph Hannon of Frostburg; Joseph Footen, Thomas Martin and John Martin, Piedmont and Francis O'Connell of Jeannette, Pa.
Emanuel Martinm the oldest resident of Franklin county, Pa., died at his home in Chambersburg, aged 96 years, 1 month and 9 days. Westernport, Oct. 7 — Mrs. Emma Marie Martin, 78, wife of Robert Martin Sr., 306 Philos street, Westernport, died last night. A native of England, she came to this country with her parents, the late Mr. and Mrs. Benjamin Wright, when five years old. She was a member of the First Baptist Church. Surviving, besides her husband, are eight children, Robert, Ernest, Frederick, Arthur and Allen Martin, all of Westernport; Mrs. Robert Freal, Catonsville, Md. ; Mrs. H. T. Meakin, Los Angeles; Mrs. Ray Rounds, San Francisco, and a brother, Luther Wright, Westernport. Parents: John T Martin .Sr. and Viola E. Bennett Martin of Keyser, WV. FROSTBURG — Mrs. Esther Frances Martin, 70, of Morantown, died yesterday at Sacred Heart Hospital, Cumberland, where she had been admitted February 12. She had been in ill health for some time. Born in Mt. Savage, she was a daughter of the late Charles and Mary (Collins) Dickel, and was the widow of Guy E. Martin, who died in 1962. She was a member of St. Michael's Catholic Church. Surviving are three daughters, Mrs. Anna Lee Femi, with whom she resided; Mrs. Virginia Winebrenner, Oldtown, and Mrs. Norma Stewart, Wellersburg, Pa.; two sons, John C. Martin, Cash Valley Road, and James E. Martin, Lonaconing; a sister, Mrs. Anna Winebrenner, Mt. Savage; four brothers, Joseph Dickel, here; Ralph and Milner Dickel, Mt. Savage, and Paul Dickel, Peninsula, Ohio; 30 grandchildren and 19 great-grandchildren. The body is at the Durst Funeral Home, where friends will be received from 7 until 9 p.m. Mass of the Christian burial will be celebrated Friday at 9:30 a.m. in St. Michael's Catholic Church. Interment will be in Mt. Savage Methodist Cemetery. A Christian wake service will be conducted Thursday at 7:30 p.m. in the funeral home. Grandsons will serve as pallbearers. Martin, Eva B. Kelly --Age 78 years, of Markleysburg, Pa., died Monday, September 23, 1991, in Sourth Fayette Nursing Center. She was born January 29, 1913, in Marklelysburg, Pa., daughter of the late Frank and Nancy Kelly. She was a member of Marklleysburg Church of the Brethren. Surviving are her husband, James Martin; children: G. Wade Martin of Bethel Park, Pa., J. Larry Martine of Charlottesville, Virginia, Mrs. Charles (Regina) Jack of Knox, Pa.; ten grandchildren; eight greatgrandchildren[sic]. Predeceased by two brothers, Gilbert and Delmar Kelly. Friends will be received in the Donald R. Crawford Funeral Home, Markleysburg, today 7 to 9 p.m., Wednesday 2 to 4 and 7 to 9 p.m. and Thursday until 11 a.m., the hour of service, with Rev. Kenneth Dolan officiating. Interment at Thomas Cemetery, Markleysburg, Pa.
SHORT GAP, W.Va. - Evaline Elizabeth Martin, 74, of Short Gap, formerly of Baltimore, Md., died Sunday, May 7, 2000, at her residence. Born Jan. 22, 1926, in Wiley Ford, she was the daughter of the late Frank P. and Delphia (Landis) Wagoner. She also was preceded in death by two brothers, Thomas Wagoner and Orville Wagoner; and one sister, Verna Williams. Mrs. Martin was a homemaker. Surviving are two sisters, Bertha Porter and husband Elmer, Short Gap, and Yvonne Kuykendall, Winchester, Va.; one brother, Paul Wagoner Sr. and wife Darlene, Short Gap; and numerous nieces and nephews. Scarpelli Funeral Home, P.A., 108 Virginia Ave., was in charge of the arrangements. Mr. George Martin, died at his home near Alaska, March 11, of dropsy. He was buried at Alaska, March 13. He leaves a family. Mr William Martin, of Keyser, is a son. MT. SAVAGE — Guy E. Martin, 63, died last night in Miners Hospital, Frostburg, where he was admitted Wednesday. Born in Mt. Savage, he was a son of the late John H. and Rachel (Black) Martin. He was employed by the County Roads Department and held membership in Mt. Savage Methodist Church. Surviving are his widow, Mrs. Esther (Dickel) Martin; three sons, John C. Martin, RD 1, Cumberland: Guy E. Martin Jr., Corriganville, and James E. Martin, at home; three daughters, Mrs. Fred Winebrenner, Mt. Savage; Mrs. Robert Stewart, Wellersburg, Pa., and Mrs. Joseph Femi, Morantown; two brothers, Eugene Martin, Mt. Savage, and Charles G. Martin, Eckhart, 24 grandchildren and four great-grandchildren. The body is at the Durst Funeral Home, Frostburg, where friends will be received today from 7 to 9 p. m. and tomorrow from 2 to 4 and 7 to 9 p. m.
GRANT COUNTY - Mrs. Hannah Martin, aged about 71 years, wife of John Martin, died at her home here last Friday at noon, from paralysis, she having been paralyzed the night before. Helen Jane Werner Miller, 89 of Warren, Ohio, went home to be with the Lord on Sunday morning, December 22, 2013, at Cortland Healthcare Center, Ohio. She was born February 7, 1924 in Garrett, the daughter of the late Robert and Nellie Grace Miller Werner. She had lived in Trumbull County, Ohio since 1969 after coming from Rockwood. Preceded in death by her daughter: Merlene Joy Miller; sisters: Mary Sweeney and Velma Miller; and brothers: Earl, Fred, Joseph and Georger Werner. She is survived by three daughters, Sandy Jane (John) Adrian of Warren, Ohio, Rose Marie (Jerry) Anderson and Carol Jean (Tom) Peters both of Champion, Ohio; two sons, Bernard Ray (Kathy) Miller of Rockwood, and David Duane Miller of Ligonier; eight grandchildren and ten great grandchildren. Helen was a 1941 graduate of Garrett, Pa. High School and a 1942 graduate of Berlin High School in Pa. She worked for 17 years as a nursing assistant at St. Joseph Health Center in Warren, retiring in 1989. She was a member of Champion Presbyterian Church, where she belonged to the Church Ladies Aide Society, the Seekers Bible study group and the senior citizens (SOC) group. She had been a member of the Garrett Reformed Church in Garrett. Helen enjoyed knitting, crocheting and was an avid reader. A funeral service will be held at noon on Thursday at Champion Presbyterian Church in Warren, Ohio. Friends will be received from noon to 2 p.m. Friday, Dec. 27, 2013 at Price Funeral Home in Meyersdale with graveside service to follow at Highland Cemetery in Garrett, with Jane Metzgar officiating. Memorial contributions may be made to Champion Presbyterian Church, 4997 Mahoning Ave. NW, Warren, OH 44483. Henry Thomas Martin, 81, a widower, died at 9 o'clock last night at the home of his daughter, Miss Grace Martin, Cresaptown. He had been in failing health in the last year. He was the son of the late Jacob Martin and was a native of Mount Savage, where he resided until five years ago. Surviving are the following children: Mrs. George Becker, Meyersdale; Mrs. John Bolden, Frostburg; Mrs. George Crump, Mt. Savage; Samuel Martin, Frostburg; and Miss Grace Martin, Cresaptown. The funeral will be held Saturday at 2 p.m. with services at the home and burial in St. George's Episcopal Cemetery, Mt. Savage. FROSTBURG - Mrs. Hilda Martin, 74, Clarysville, died yesterday, at Sacred Heart Hospital, Cumberland, shortly after being admitted. A native of Vale Summit, she was a daughter of the late William and Rachel (Knippenberg) Delaney. Her husband, Bernard H Martin preceded her in death. Survivors include three daughters: Miss Margaret Martin of Barbarton, Ohio, and Mrs. Agnes Fisher and Mrs. Camey Williams of Frostburg; three sons: John Martin, Eckhart James Martin Clarysville, and William Donahue, Frostburg; a brother, Wiiliam Patrick Delaney, Frostburg and 17 grandchildren. Mrs Martin was a member of St Michael's Catholic Church and the Sodality of the church. The body is at the Durst Funeral Home where the family will receive friends today, from 2 to 4 and 7 to 9 p.m. Requiem mass will be celebrated tomorrow at 9:30 a.m at St, Michael's Church. Interment will be in the parish cemetery. A Christian wake service will be held at the funeral home today at 7:30 p.m.
CLARYSVILLE - James B. (Mose) Martin, 55, died Sunday at Georgetown University Hospital, Washington, D.C. Born in Frostburg, he was the son of the late Bernard Martin and Hilda (Delaney) Martin. Mr. Martin was an Army veteran and was employed by the Westvaco Corporation as a pipefitter. He was a member of St. Michael's Catholic Church, Frostburg, and the Clarysville Volunteer Fire Department. Surviving are his widow, the former Margaret Funk; two daughters, Mrs. Marianne Uphold, Mountain Lake Park; Miss Patricia Lynn Martin, at home; one son, James Thomas Martin, at home; three sisters, Miss Margaret Martin, Barberton, Ohio; Mrs. Rita Williams and Mrs. Agnes Fisher, both of Frostburg. Friends will be received at the Durst Funeral Home, Frostburg, Tuesday from 7 to 9 p.m. and Wednesday 2 to 4 and 7 to 9 p.m. A Christian wake service will be held at the funeral home Wednesday at 3:30 p.m. Members of the Clarysville Volunteer Fire Department will hold a memorial service at the funeral home Tuesday at 8 p.m.
"Double Martin Rites-A requiem mass for a father and his son, both formerly of Pekin and Lonaconing, was held Saturday in St. Paul Catholic Church, Akron. James F. Martin, 75, of Akron, died December 28 there and his son, John LeRoy Martin, 52, died in the same city on December 30. The elder Mr. Martin was a member of the Knights of Columbus and the Ancient Order of Hibernians. He was a supervisor for Firestone Products Company where he had worked for over 40 years. His wife, Mrs. Flora (McKenna) Martin, preceded him in death. His parents were Patrick H. and Catherine (Barry) Martin. He is survived by one daughter, Mrs. Verna Thomas, Akron, and two brothers, Roy Martin, Hollidaysburg, Pa., and Julius Martin, Akron. Attending the funeral and interment in Akron was James T. Miller and granddaughter, Diane Furstenburg, of this city." James Edward Martin, 47, of 208 North Centre Street, was found dead in his car late Wednesday along State Route 55 at Midland. Mr. Martin died of self-inflicted gunshot wounds, according to State Police. Mr. Martin was born on Cash Valley Road, a son of James B. and Helen (Scharf) Martin. He was employed as an inspector in the machine shop at Allegany Ballistics Laboratory and was a member of St. Patrick's Catholic Church and Cumberland Lodge 63, BPO Elks. He was a veteran of World War II and the Korean War. Surviving are his widow, Teresa (McMahon) Martin, Midland; three children, Raymond, Joseph and Carol Martin, all at home, and two brothers, R. Thomas, Painesville, Ohio, and Leo Martin, Northfield, Ohio. The body is at the Stein Funeral Home where friends will be received from 2 to 4 p. m. and 7 to 9 p. m. Mass will be celebrated tomorrow at 10 a. m. at St. Patrick's Church and burial will be in Sunset Memorial Park. The rosary will be recited at the funeral home today at 8:30 p. m. Pallbearers will be Aloysius Martin, Donald Smith, Paul Martin, Joseph P. McGann, James McGann and Stephen McGann. Cumberland Md, Dec 30 - James W Martin, 34 years old, car inspector on the Western Md railway was killed this morning in the yards at Ridgeley W Va, opposite Cumberland, when a passenger engine backed into the front of a work train on which Martin was standing. The end of the coach was demolished and Martin's body reduced to pulp. A heavy fog prevailed at the time. Martin worked all night and was returning home. Martins is survived by his wife and one daughter. WESTERNPORT — John B. Martin, 85, retired meat cutter of Brophytown, Franklin, died this morning in Allegany County Infirmary, Cumberland, where he had been a patient for 11 days. A native of Little Capon, W. Va., Mr. Martin had resided in the Westernport area for 23 years. His parents were the late Joseph and Grace Martin. He was a member of Church of the Brethren, Burlington, W. Va. Survivors include his widow, Mrs. Martha E. Martin; five sons, James W. Martin, Westernport; Boyd Martin, Burlington; Jesse C. Martin, Baltimore; Walter H. Martin, Romney, W. Va., and John G. Martin, Hayfield, Va., and five daughters, Mrs. Homer See, Rada, W. Va.; Mrs. John R. Shumaker, Burlington; Mrs. Elijah Parish, Mrs. Frank M. Myers and Mrs. Charles Spencer, Keyser, W. Va.; and Mrs. Ralph Wiland, New Germany. The body will be taken to the Shumaker home tomorrow for services Saturday at 2 p. m. Burial will take place in the cemetery of Beaver Run church, Burlington. "John E. Martin, 74, a labor leader in Washington for many years and a native of Lonaconing, died Monday at Calvert County Hospital after a long illness. He lived in Cove Point, Md., for the past three years. While he was born in Lonaconing, he lived most of his life in Washington. For 44 years he was a member of the Steamfitters Local 602 in Washington and had been a superintendant on several construction jobs in the D. C. area. He was elected assistant business manager of the union local in 1946, financial secretary in 1956 and business manager in 1956. He retired in 1967 from that position. Since 1926 Mr. Martin had served as a delegate to the Greater Washington Central Labor Council and at the time of his death was on the executive boards of the Central Labor and Building Trades Councils. He also served as a welfare trustee for Local 602. Mr. Martin enlisted in the Navy at the beginning of World War I and served his enlistment as a ship fitter in the Norfolk shipyard. Mr. Martin is survived by his wife, the former Mitzi M. Falentin; three children, Catherine M. Martin, of Kensington; and Mary Olga Kitts, and Thomas J. Martin, both of Silver Spring; and four sisters, Mary F. Moran, Agnes J. Martin, Florence Jenkins and Clara C. Stumpf, all of Washington." John Roy Martin, 51, of 216 Saratoga street, died today at his home. He was billing agent for the Western Maryland Railway. A native of Cumberland, he was a son of the late Marcellus and Alice (Kelly) Martin. Surviving are his wife, Mrs. Nellie W. (Morgan) Martin; a daughter Miss Alice Martin, two brothers Arthur and Claude Martin; four sisters, Misses Irene and Ruth B. Martin, Mrs. Robert B. MacBeth, all this city; and Mrs. Arthur Travers, Gary, Ind. MORGANTOWN, W.Va. — Joseph William Martin Sr., of Morgantown, passed away Tuesday morning, Nov. 30, 2004, in his home. Joe was born March 13, 1939, in Fort Ashby, a son of the late Melvin H. and Tempest L. Welch Martin. He was a former member of the Trinity United Methodist Church in Fort Ashby. He attended Allegany High School in Cumberland, Md., and was a graduate of the Class of 1957. Mr. Martin then attended the University of Maryland and received a bachelor of science degree in physics from West Virginia University in 1962. Joe retired in 1999 from the National Energy Technology Laboratory in Morgantown. He was employed for 36 plus years with the federal government where he provided technical, managerial, administrative, and engineering expertise in various environmental and energy related fields. During his career he was author and co-author of more than 40 technical papers and presentations, held patents and received numerous awards for superior job performance and special recognition acts. Joe was an accomplished pianist and very much enjoyed playing. In addition to his parents, he was preceded in death by his only brother, Melvin Marion Martin Sr. He is survived by four children, Joseph William Martin Jr. of Glen Burnie, Md., Traci Jo Martin of Morgantown, Michael Scott and spouse Mary Ann Martin of Camp Lejeune, N.C., Edwin Robert and Molly K. Martin of Morgantown; his beloved grandchildren, Sasha Jo Fisher, Dustin Dale Fisher, Josie Harris, and Jessica Minnich; and great-grandchildren, River and Oliver Minnich. He is also survived by his former spouses, Judith Gillette Martin and Mitzie Rexroad Martin; sister-in-law, Mary Margaret Martin and numerous nieces and nephews. Family and friends will be received at Hastings Funeral Home, Morgantown, on Friday, Dec. 3, 2004. The body will then be moved and lie in state at the Trinity United Methodist Church in Fort Ashby, from noon until time of funeral service at 1 p.m., with the Rev. Dallas Forren officiating. Interment will follow in the Fort Ashby Cemetery. Mrs. Julia Naomi Martin, 90, of Corriganville, died Wednesday at Memorial Hospital, where she was a patient for one day. She had been in ill health for several years. Born in the Narrows here, she was a daughter of the late Conrad Lapp and Martha E. (Everline) Lapp. Her husband, Bernard Earl Martin, died in 1945. Mrs. Martin was a former driver for the Allegany County Board of Education, transporting retarded children by car to the old Pennsylvania Avenue School. She was a member of St. John’s United Church of Christ, Corriganville, and the Ladies Aid of the church. Surviving are three daughters, Mrs. Amelia M. Ringler, Mrs. Mary Jane Compton and Miss Opal A. Martin, all of Corriganville; two grandchildren and two great-grandchildren. Friends will be received at the Silcox-Merritt Funeral Residence Thursday and Friday. Services will be conducted Saturday at 11 a.m. at St. John’s United Church of Christ by the Rev. David Long. Interment will be in Greenmount Cemetery. MT. SAVAGE - LaVada D. "Vadie" Martin, 71, of Mt. Savage, died Friday, October 17, 2003, at Sacred Heart Hospital. Born October 9, 1932 in Zihlman, she was the daughter of the late George and Rose (Porter) Donius. She was formally employed at Berkowitz Co. Surviving is her husband, Paul J. Martin; two sons: Roger Lee Martin and wife Tina, Bedford, and Bradford Eugene Martin, and best friend Sherry Lynn Mellott; six grandchildren: Denielle Lepley, Jared Scott Martin, Aubrie Davis, and husband, Brian, Derek Paul Martin, Lindsey Rennee Martin, and Charlie Ray Mellott; one great-grandson, Tyler Wade Davis; and one brother, George "Pete" Donius and wife, Ina Lee, Kemp Drive, Frostburg. There will be no visitation. Funeral services will be conducted at the Sowers Funeral Home, P.A., 60 W. Main St., Frostburg, on Saturday, October 18, 2003 at noon with The Rev. George M. Harpold officiating. Interment will be at Rest Lawn Memorial Gardens. Mrs. Leora Florence Martin, 81, of Cash Valley Road, died yesterday at her residence. A native of Hyndman RD 1, she was a daughter of the late Benjamin W. and Mary E. (Emerick) Troutman, and was the widow of Clarence W. Martin. Surviving are two sons, Elwood M. and Luther W. Korns, at home; a daughter Mrs. George E. Neil, Hagerstown; a sister, Mrs. Anna Smith, Turtle Creek, Pa., and three grandchildren. The body is at the Zeigler Funeral Home, Hyndman. A service will be conducted there Monday at 11 a. m. Rev. Willard M. White will officiate and burial will be in Rest Lawn Memorial Gardens. Mrs. Lillian W. Martin, 92, of 56 National Highway, LaVale, died yesterday. She had been in failing health a number of years. Born in this city, she was a daughter of the late Charles L. and Amanda M. (Butts) Rizer. Her husband, William A. Martin, died in 1942. Mrs. Martin was a member of the Lutheran Church. Surviving are five daughters, Mrs. Harold V. Bloom, Cocoa, Fla.; Mrs. Robert C. Elerich, city; Mrs. Harry H. Price, Homewood Addition; Mrs. Charles W. Easton, Hyattsville; and Mrs. Thomas S. Brode, LaVale; four sons, Luther W., Ralph L., Paul A. and Charles F. Martin, all of Cumberland; 26 grandchildren; 66 great-grandchildren and 18 great-great-grandchildren. The body is at the George Funeral Home where friends will be received today from 7 to 9 p. m. and tomorrow from 2 to 4 and 7 to 9 p. m. Services will be conducted at 2 p. m. Sunday in the funeral home by Rev. Charles H. Lisse, assistant pastor of St. John's Lutheran Church. Interment will be in Hillcrest Burial Park. Luther W. Martin, 73, of 223 Arch Street, died yesterday at Memorial Hospital where he had been a patient since August 1. A native of Cumberland, Mr. Martin was a son of the late William A. and Lillian W. (Rizer) Martin. Surviving are five sisters, Mrs. Harold V. Bloom, Cocoa, Fla.; Mrs. Robert C. Elrick, city; Mrs. Harry H. Price, Homewood Addition; Mrs. Charles W. Easton, Hyattsville, and Mrs. Thomas S. Brode, La Vale; and three brothers, Ralph L., Paul A. and Charles F. Martin, all of here. The body is at the George Funeral Home. Services will be conducted there Wednesday at 1 p.m. by Rev. LaVern D. Rasmussen. Interment will be in Hillcrest Burial Park. Meyersdale, Pa., Nov. 4 - Mrs. Lydia Martin, 70, died yesterday from a heart attack. She was a native of Salisbury, and had been a resident of Meyersdale for about 30 years. She was first married to Columbus Shaw, a coal operator of the Meyersdale region, who met his death under a fall of coal. To this union four children were born, Potter Shaw, Cleveland, Ohio; Mrs. Helen Stewart, Latrobe; Mrs. Hester Horner, Somerset, and Mrs. James B. Slicer, North street, Meyersdale. A sister, Mrs. Lottie Emerick, resides in Akron, Ohio. Some years ago Mrs. Martin was united in marriage, with Henry D. Martin, of Clarksburg, W. Va., who died several years ago. Her father, the late John Meager, besides looking after his extensive coal interests, was also a minister of the Methodist church at Salisbury. Mrs. Martin, was a member of the First Methodist church, the Garden Club and the Woman's Club. Mrs. Margaret Trimble Martin, 26, wife of Henry F. Martin, formerly of this city, died yesterday morning at Providence Hospital, Washington, D. C., following an operation for acute appendicitis. She was employed as an operator by the Chesapeake and Potomac Telephone Company in Washington where her husband is also employed, and had worked at the local exchange for several years before moving to Washington last year. Beside her husoand she is survived by her mother, Mrs. W. A. Trimble, of Frostburg, and by two sisters, Miss Maryland Trimble, R. N., of Washington, and Mrs. G. V. Lammert of Frostburg. The body arrived here last night and was taken to the home of her aunt, Mrs. J. W. Shea, 74 West Union street, Frostburg. Funeral services will be held at 3 p.m. tomorrow at St. George's Episcopal Church, Mt. Savage, conducted by the rector, Rev. Dr. J. W. Torkington and Rev. Henry F. Kloman, rector of the Emmanuel Episcopal Church, this city. Interment will be in the church cemetery. ROMNEY — Mrs. Martha Elizabeth Martin, 88, died Monday at the home of a daughter, Mrs. Emily Fee, of Rada. She was a daughter of the late William and Lucinda (Shears) Bowman. Her husband was the late John B. Martin. She was a member of the Brethren Church. Surviving are six daughters: Mrs. Fee, with whom she lived; Mrs. Mary Parish, Mrs. Ida Spencer, and Mrs. Susan Myers, all of Keyser; Mrs. Nettie Shoemaker, Burlington, and Mrs. Lucy Wiland, Grantville. Also surviving are four sons: John Martin, Winchester, Va.; Walter Martin, Cumberland; James Martin, Westernport; and Jesse Martin, Baltimore. Rites will be conducted tomorrow at 2 p. m. at Beaver Run Brethren Church with Rev. Morris Beechley in charge. Interment will be in Beaver Run Cemetery. The body is at the home of Mrs. Fee. Mrs. Mary Eliza Martin aged 60 years, wife of Mr. C. Ed Martin, a well known farmer of Rio, Hampshire, Co., W. Va., who was operated on at the Allegany Hospital on Thursday last for the removal of gall stones, died at that institution at two o'clock this morning. She was a daughter of the late James Webb, of near Springfield, W. Va., and leaves her husband and three children, Miss Bettie H. Martin and Messrs William G. and John A. Martin, all of Rio. Mr Martin and son, William, were at the hospital at the time of her death. The body will be taken to her former home today for interment. Matthew Martin, Sr., died Monday, October 3 at his home in Gilmore Funeral services will be conducted Wednesday, October 5, at 3 p.m., at his late residence. The Rev. Joseph Young, of the J. E. church, of Midland, will officiate. Interment will be in Allegany cemetery at Frostburg. Arrangements by M. Eichhorn, of Lonaconing. Melvin Hillearv Martin, 58, of Oldtown Road, died Tuesday in Memorial Hospital. Born February 21, 1907, at Antioch, W.Va., he was the son of the late Joseph and Mary (Chamberlain) Martin. He is survived by his widow, the former Tempest Lucille Welch; two sons, Melvin M. Martin, Oak Ridge, Tenn., and Joseph W. Martin, Morgantown, W.Va.; one sister, Mrs. Marie Homan, Elkhart, Ind. ; five grandchildren. Mr. Martin was a member of the Methodist Church and a representative of New York Life Insurance Company. The body is at the George Funeral Home. A service will be conducted there Saturday at 10:30 a.m. by Rev. B. F. Hartman. Interment will be in Fort Ashby Cemetery. FROSTBURG — Michael M. Martin, 79, of Frostburg, passed away on Tuesday, April 9, 2002, at home with his family. Born July 4, 1922, in Romney, W.Va., he was the son of the late Dr. Dailey Martin and Anna Carson (Ewers) Martin. He was also preceded in death by, one brother, Dr. Franklin Martin; and two sisters, Anna Dale Volkin and Linda Levings. Mr. Martin was a graduate of Romney High School and a Navy veteran of World War II. He was retired as an auto salesman and dealer having sold Ford cars and trucks for over 50 years, beginning at Heiskell Motor Sales in Frostburg, in 1948. Throughout his career, The Ford Motor Company presented Mr. Martin with numerous awards for sales achievement and for providing outstanding service to his customers. Mr. Martin was a member of St. Paul’s Lutheran Church, the Clinton Lodge 86 AF&AM, Scottish Rite, the Ali Ghan Shrine, Cumberland, the Mounted Patrol Unit, the Frostburg Elks, the American Legion (Farrady Post), and the Romney VFW. He is survived by his wife of 51 years, Joann Glotfelty Martin; one daughter, Pamela Adams and husband Ronald, Grantsville; two sons, Michael R. Martin, Raleigh, N.C., and Steven S. Martin and wife Nancy, Richmond, Va.; six granddaughters, Kieran, Shawn, and Lauren Adams, Chelsea Martin and Megan and Meredith Martin; and several special nieces and nephews. Friends will be received at the Hafer Chapel of the Hills Mortuary, 1302 National Highway, LaVale, on Thursday from 2 to 4 and 7 to 9 p.m. Funeral services will be conducted at the funeral home on Friday at 11 a.m. with the Rev. Michael H. Tammoria officiating. Interment will follow in the Frostburg Memorial Park. Contributions may be made in memory of Michael, to St. Paul’s Lutheran Church, Frostburg, The American Cancer Society, or Hospice Home Care of Western Maryland Health System, Cumberland, MD. Pallbearers will be Eugene Harden, J. William Hill, Dr. James Poland, John D. Ware, David Wilson, and Thomas Winner. Mr Odie E Martin, died at his home in Keyser Tues March 7th, aged 30 years, and was buried Wed., the funeral services being conducted by Rev F H Havenner. MR Martin was a brakeman on the third division B&O RR and had come home from Cumberland about three weeks ago, being too weak for duty. His mother, Mrs T A Martin; two sisters, Mrs R W Nine of Keyser, and Mrs W J Carpening of Clarksburg; and four brothers, Basil of Keyser, Ralph of Cumberland, and Ross and Guy of Clarksburg are left to mourn his untimely death. They were all present at the funeral. Mrs James C Watson and sister, Miss Ella Bartlett of Fairmont and Miss Ethel Martin of Clarksburg were among the out of town friends who attended the funeral services. Mr Martin was a popular young man and many hearts are saddened because of his death. Olive Blanche (Blamble) Martin, 89, Oakland, died on Monday, Oct. 8, 2012, at Dennett Road Manor Nursing Home. Born on March 26, 1923, in Gorman, she was a daughter of the late Charles and Esther (Liller) Blamble. She was the last surviving member of her parents' children. She was also preceded in death by her husband, Charles Junior Martin, on Aug. 24, 2001; a very special son-in-law, "Fuzz" Shaffer, on Aug. 23, 2008; six brothers, Paul, Elwood, Keith, John, Charles, and Delbert Blamble; and two sisters, Alice Feather and Ethel Myers. Fuzz and Barbara were always there for her and Junior and helped work the farm with them for 45 years. The farm, purchased in 1941, was their pride and joy. After the death of Junior, her oldest daughter Barbara and Fuzz took care of her by accompanying her to Florida during most of the winters and helping her with gardening and canning, which she dearly loved. Piecing quilts by hand was another one of her all-time favorite things to do. Olive had been a resident of Dennett Road Manor since May 2007. She is survived by five daughters, Barbara (Shaffer) Sines, Peggy Kitzmiller, Linda Coddington, Shirley Fletcher, and Sheila Shaffer; eight grandchildren; and 11 great-grandchildren. Friends were received at Burdock-Fredlock Funeral Home, Oakland, where a service was conducted today, Oct. 11, with Pastor Ed Calhoun officiating. Interment followed in St. John's Lutheran Cemetery. In lieu of flowers, donations may be made to the Southern Garrett County Rescue Squad, P.O. Box 378, Oakland, MD 21550; or a charity of choice. Olive’s family would like to extend special thanks to Laura Partridge, who went above and beyond her call of duty, and Amber Sines during Mother's last remaining days and to all the other nursing staff and aides for her care and keeping her comfortable. "The body of Patrick H. Martin, 66 years of age, who died at the home of a daughter, Mrs. James T. Miller, 30 Oak street, Wednesday night, will be taken to Lonaconing for interment tomorrow morning. The funeral will be held from St. Mary's Catholic Church, Lonaconing, at 10 o'clock, with burial in the church cemetery." The body of Peter Martin, 80, who died Wednesday at Union Memorial Hospital, Baltimore, following an accident, will arrive at the home of a niece, Miss Lillie Freithof, 434 Chestnut St tomorrow. Before going to Baltimore in 1909, he operated cafes on Centre, Baltimore and North Mechanic streets in this city. He was a native of New Baltimore, Pa and came here when 21 years of age. He returned to Cumberland in 1923 and resided with a daughter, Mrs R V Coulehan, LaVale, until six years ago when he again went to Baltimore. Mr. Martin had visited his son, Louis Martin, Hamilton, Baltimore, Wednesday and was returning to his Linthicum Heights home when struck by a street car. Mr. Martin's wife, Mrs. Clara (Maurey) Martin, Frostburg, died in 1921. He is survived by one son, Louis, Baltimore; two daughters, Mrs. Coulehan and Miss F. Zelma Martin, Baltimore; one sister, Mrs. Susan Felton, Cumberland; a brother, Joseph Martin, New Baltimore, and a granddaughter, Zelma Blanche Martin, Baltimore. He was a son of the late Francis and Margaret Martin, New Baltimore. Philip Martin, 82 years of age, died at his home 523 N Centre St this morning. He is srvived by his widow and six sons and two daughters - Frank, Andrew, William, George, Dominic and James Martin; Mrs Anna Michaels and Mrs Agatha Smith. Mr Martin was a native of Greene Co, Pa. Shortly after the beginning of the Civil War, he enlisted in the Eighteenth Pennsylvania Cavalry of the Union Army and continued in the service throughout the war. He participated in the battle of Gettsyburg and many other historic engagements, fighting under General Custer and General Fitzpatrick. After the close of the war, Mr Martin came to Allegany County and settled on a small farm in Cash Valley near Cumberland. He resumed his trade as a carpenter and divided his time between light farming and building work in the county hereabouts until a few years ago when he retired from active labor. He married Miss Ruth Helen Arnold of Cash Valley shortly after coming to Allegany County. Mrs Martin died some five years ago. A few months ago, Mr Martin married Mrs Emanuel Eversole, who survives him. The funeral will take place Monday morning from St Patrick's Catholic church of which Mr Martin had been a member for sixty years. Interment in the church cemetery. A 42-year-old Clarysville woman was killed and four Frostburg State College students injured in an early morning accident today on U.S. Route 40 at the Piney Mountain intersection in Eckhart. According to State Police, Mrs. Ruth Evelyn Martin, of Route 55, Clarysville, was killed instantly after her automobile collided with another vehicle operated by Kent Almony Dixon, 20, of White Hall, Md., a student at Frostburg. [Details of accident.] 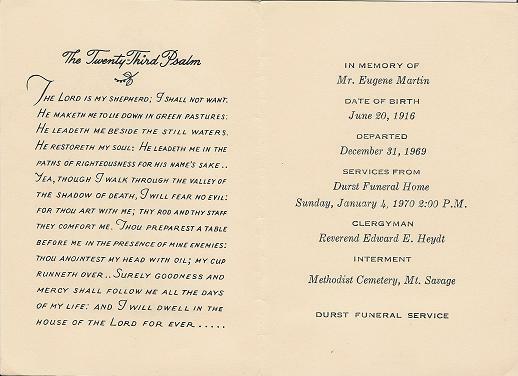 Born in Eckhart, Mrs. Martin was the daughter of Douglas Wright, Eckhart, and the late Nellie (Porter) Wright. She was preceded in death by her husband, John W. Martin, on February 6, 1972. She was a member of St. Michael's Catholic Church, Frostburg; Ladies of the Moose, Frostburg, and the Ladies Auxiliary of the Clarysville Volunteer Fire Department. Besides her father, she is survived by one daughter, Mrs. Nancy Winebrenner, Eckhart; four sons, Bernard Martin, John Martin, James Martin and Joseph Martin, all at home; two sisters, Mrs. Thelma Blank, Mt. Savage; and Mrs. Betty Puffinburger, Indian Head, and one grandchild. The body is at the Durst Funeral Home, Frostburg, where friends will be received today from 7 to 9 p.m. and tomorrow from 2 to 4 and 7 to 9 p.m.
FORT ASHBY, W.Va. — Tempest Lucille Martin, 80, of Oldtown Road, formerly of Fort Ashby, died Saturday, Nov. 3, 1990, at Memorial Hospital. Born March 14, 1910, in Claysville, she was the daughter of the late William A.C. and Augusta (Likins) Welch. Her husband, Melvin H. Martin, preceded her in death July 30, 1963. She was also preceded in death by three brothers. Mrs. Martin was a graduate of Allegany High School. She received her certificate in X-ray technician training in Hoboken, N.J., and was one of the first registered X-ray technicians in the United States. She was an X-ray technician and the office manager for Drs. Cawley, Mock, Miller and Light at Memorial Hospital. She was a member of Trinity United Methodist Church in Fort Ashby. Surviving are two sons, Melvin M. Martin, Oak Ridge, Tenn.; and Joseph W. Martin, Morgantown; ten grandchildren and five great-grandchildren. Friends will be received at the Fort Ashby Funeral Home Monday and Tuesday. Services will be conducted Wednesday at 11 a.m. at Trinity United Methodist Church, Fort Ashby. The Rev. James E. Shepherd II will officiate. Interment will be in the Fort Ashby Cemetery. Active pallbearers will be Scott Welch, Rodney Welch, Jerry Adams, Steve Adams, Randy Adams, and Jerry Growden. Honorary pallbearers, all nephews, will be William Welch, Dale Welch, Richard Welch, Max Welch, Gene Welch, and Jack Welch. Piedmont, W. Va. - Thomas J. "Gannie" Martin, 69, of 250 West Fairview Street, who was a service officer of Kelly-Mansfield Post 52, American Legion, for over a quarter of a century, died at his home yesterday. A recent patient at Baker VA Center, Martinsburg, Mr. Martin had been business manager of the local post for 15 years and served two terms as post commander. He was a past member of the Rehabilitation Committee of the West Virginia Department, American Leagion, and in June 1955 was presented a citation for outstanding work in verterans activities. A native of Lonaconing, he was a son of the late John A. and Mary (Mullen) Martin and had resided here for 51 years. He was a member of St. Peter's Catholic Church in Westernport, the Holy Name Society of the church and of Piedmont Council 685, Knights of Columbus. His wife was the late Mrs. Genevieve (Curran) Martin. Mr. Martin is survived by a daughter, Mrs. John Meyers, with whom he resided; a son, John A. Martin, of Westernport; a brother, John E. Martin, Springfield, Va. Also surviving are four sisters, Mrs. Mary F. Moran, Mt. Rainier, Md. ; Miss Agnes J. Martin, Mrs. Robert Jenkins, and Mrs. Clara Staumpf, all of Washington and three grandchildren. The body will be at the Fredlock Funeral Home where friends will be received from 7 to 9 p.m. today and from 2 to 4 and 7 to 9 p.m. tomorrow. The rosary will be recited tomorrow at 8:30 p.m. in the funeral home. A requiem mass will be celebrated on Friday at 9:30 a. m. in St. Peter's Church and interment will be in the parish cemetery where military honors will be accorded by the local legion post. SOMERSET — Mrs. Walter William (Violet Mary Friedline) Martin, 52, of Listie, died in Somerset Community Hospital. She leaves her husband, her mother, one son, two grandchildren and five sisters and two brothers. William Addison Martin, 67, died yesterday morning after an illness of one month. A native of Mineral County, West Virginia, he was a son of the late Addison and Victoria (Marker) Martin. He operated a service station in the Narrows for the past six years. In 1896, he and his father operated a meat market beneath the old city hall. He continued there until 1900 when he opened a meat market on Maryland Avenue. In 1917, this business was taken over by his brother George W. Later he operated a trucking business and real estate firm. Before moving to Narrows Park, he was active in the First Baptist Church. He is survived by his wife, Mrs. Lillian (Rizer) Martin; the following children, Luther W., at home; Mrs. Ruth Bloom, Mt. Savage Rd. ; Carl W., Nave's Crossroads; Mrs. Mildred Elrick, Narrows Park; Mrs. Lucille Price, Homewood addition; Mrs. Virginia Easton, Narrows Park; Mrs. Catherine C. Johnson, this city; Ralph L., Narrows Park; Paul A., this city; Charles F., Mt. Savage road. Two brothers, Robert of Miami, Fla., and George W., this city; four sisters, Mrs. John I. Vandegrift, this city; Mrs. Laura Fitzwilson, Richmond, Va.; Mrs. Charles Runkles, this city; Mrs. Benjamin Moreland, this city; and 23 grandchildren also survive. The body will be taken to the home of his daughter, Mrs. Harold Bloom, Mt. Savage Road. "PEKlN-William F. Martin, 72, native of Pekin died Saturday at his home in Kansas City, Kan. He was a son of the late Patrick H. and Catherine (Barry) Martin. Survivors include his widow, several children; three brothers, James and Julius Martin, both of Akron, and Roy Martin, Hollidaysburg, Pa., and a sister, Mrs. James T. Miller, Cumberland. Burial was held this afternoon in Kansas City." Funeral services for William G. Martin, 56, of 717 Shawnee avenue, died at Allegany Hospital late yesterday, afternoon as the result of injuries received when he walked into the side of a Baltimore and Ohio Railroad east-bound freight at the Knox street crossing, Tuesday, will be conducted at 9 a.m. Saturday, at St. Patrick's Catholic church. Interment will be in the church cemetery. Surviving are his widow, Mrs. Lucy G. Martin; eight sons, Gerard, Vincent, Leonard, Richard, James, Paul, Robert and John; two daughters, Mary and Dorothy; four brothers, Frank, Andrew, Dominick and James; and two sisters, Mrs. Joseph Michaels and Mrs. Agatha Spoerl. Mr. Martin, a well-known contractor, built a number of the finer residences and business houses in this section. He was a lover of outdoor life and was an expert fox and wild turkey hunter. His father was Philip C. Martin, who volunteered at Greensburg and served in the Pennsylvania infantry in the Union Army. FROSTBURG — Michael Martirano, 78, of 252 Shaw Street, died today in Sacred Heart Hospital, Cumberland. A native of Coszensa, Italy, he was a son of the late Mr. and Mrs. Joseph Martirano. He was preceded in death by his wife, Mrs. Susan (Zupano) Martirano. Mr. Martirano was a retired stonemason, a member of St. Michael's Catholic Church, veteran of World War I, member of Farrady Post 24, American Legion; Loyal Order of Moose 348, and Fraternal Order of Eagles, Aerie 1273. Surviving are six daughters, Mrs. Theresa Kotcho, Pittsburgh; Miss Mary Martirano and Mrs. Florence Acre, both of Frostburg; Mrs. Delphine Wilson, Radford, Va.; Mrs. Frances Sponaugle, Cumberland, and Mrs. Nancy Bernstein, Miami, Fla.; five sons, Joseph, Augustine, William, Vincent and Carl Martirano, all of Frostburg, and 11 grandchildren. The body is at the Durst Funeral Home here, where friends will be received from 7 to 9 p.m. today and tomorrow from 2 to 4 and 7 to 9 p.m.